Now if you work online you’ll hear people say, oh the money is in the list and all this — I wish! What would you do differently if you did this all over again? I wish I’d started building a list sooner. That’s true. I don’t like the statement that the money is in the list. But I get the sentiment I don’t like to be chasing money for the sake of money. I don’t think that’s good and that’s the bad side of internet marketing. However it is, it is how to do it. In modern marketing process, once you’ve managed to get someone to opt into your lead magnet, once you’ve given them an offer where they exchange and they give you their email so they can download it, their email is added to an email management system. The most common ones we use is Aweber, in one of my businesses and then I also use mailchimp. I actually prefer Aweber. There are others out there, but these are the two main ones. But what they do is they manage this process for you. They make your email safe to send, and they keep them, they store them for you. You don’t have to do anything. You can put email sequences at certain days after people opt in. you can send out broadcast, you know like a newsletter or just an offer or something. For example, if you are on my list for Marketing for Owners, you are going to get a cool download with 71 tips to help you grow your business. You can go to marketingforowners.com/71. It’s been downloaded well over 5000 times. Pretty cool. And then you’ll see how this works. These things are automated. But the reason you need it is because this is where people are going to get to know you. And then they are going to get to like you. And then they are going to trust you. They are going to understand, what that you know, you’re in authority and are an expert in the matter at hand. And it doesn’t matter whether you are a marketing person like me, a fire safety person also like me, or you could be an accountant, a lawyer, you can be a landscape gardener. You can be the corner grocery, can be a pizza shop. You have the opportunity to get that connection with your audience. If you’re thinking oh I never read emails it’s all full of spam. You don’t read the spammy emails. I am going to challenge you to not send spammy emails. Send relevant emails. Imagine that you are sending an email to a mate, to a friend. And that’s how it should be. You shouldn’t just be throwing out offers, you should only email people when you’ve got something to say, and something that is going to make their day better or their life better. Don’t do it for you, do it for them. If you have something that’s of value to them. And the reason they signed up for, or opt in download is because that was of value to them. So it’s spanned upon it and so on. How Else Can You Use Your Email List? You can be offline, you could be in a clothes store when someone pays for something at the till. You can have an iPad. There are offline versions of your email lists. Mailchimp has that ability and a lot of these organizations will be able to save emails offline, and then you can upload when you are online. Doesn’t have to be live unless you have got Wi-Fi. You don’t need to be that. But you can then just ask them to enter their email and name on an iPad that is fixed to your counter. So they can’t steal it. They are going to get a surprise when they next check their emails. Someone can either say no thank you or yes. What’s that going to cost you? What are you scared of? You asked them for money when they came up to pay for the goods. They like you, they trust you. Okay. So now you are going to think, well what am I going to write to them about? If you’re clothes shop, the newest fashion, the stuff you’ve got coming in. the reason you started your shop, the reason you do what you do, what you concentrate on or whatever you niche is. The reason that you don’t sell certain clothes from certain suppliers because of your ethics. Things like that. Be personal. Be the real you, then you get real the connection and then people start to share and tell their friends to come in because Wow, I didn’t know about that you. I didn’t know that you don’t sell shoes from Nike because they’re made in Bangladesh by little children. Something with tiny hands or something like that. You could be a restaurant. Many times when restaurants give receipts they offer a special code for taking a survey. They say if you go online here, you can login and win, give feedback and win a free meal. There you go, that, what you think they are going to ask for. They are going to ask for your email address. They might ask for a text number so they can send you offers. That’s the same. They’re doing it. That’s what the big companies do because it works. You can do it. It really doesn’t cost anything. And basic Aweber account is $20 a month. What’s that in UK now? It’s like 15 pounds. You seriously can’t afford 15 pounds a month? If you can’t, I’ll suggest you think about closing up the business and getting a job. Because then you’ll be over minimum at wage and you will be better off. But I think you probably can, if you understand power of what’s going to happen with that list. That list is going to be an asset. It’s going to build up over time. You’re going to, it’s going to have 10 and then it’s going to have 13 and it’s going to have 18, then it’s going to have 200, and then it’s going to have 1000. And when you get a 1000, you know a couple years later, you got to say 1000 people who actually chose to be on your list. You didn’t spam them. 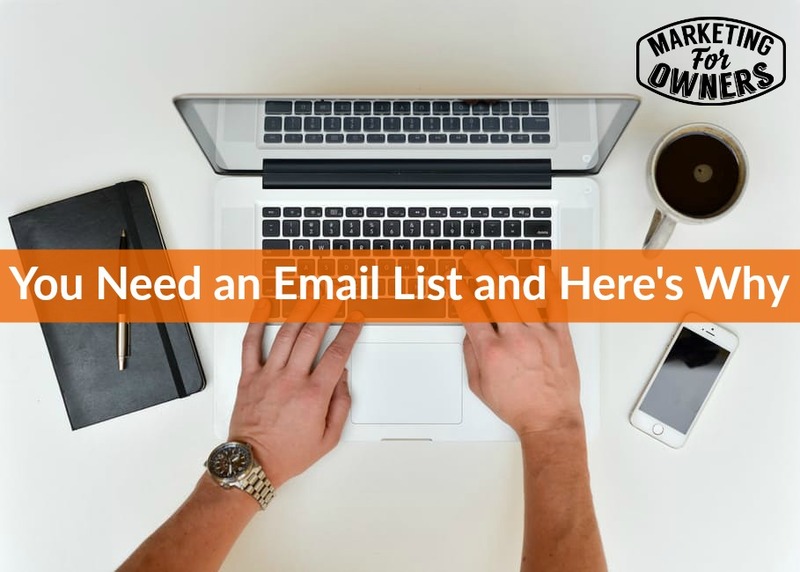 And of course if you’ve got old customers, you could open up a second list within in, and you can import those email addresses of previous customers or current customers. Then you can email them. Because again if you are not spamming, If you are doing this properly by the way, every single email, at the bottom will have an unsubscribe button. That is the beauty of using Aweber, Mailchimp and Infusionsoft, etc. people have a one click unsubscribe option. We also copy ours on it on my fire protection online and out it at the top as well. You think oh that’s going to encourage people to unsubscribe. Hey, if they want to unsubscribe, they want to unsubscribe. Just let them. Don’t upset them. It’s their right. It’s not yours, okay. Don’t worry about it. People don’t want your stuff, allow them to not get it. And then not to accuse you are spamming them. So in the list, overtime you are going to contact them about things, and then every now and again, in that restaurant you have got a slow Tuesday. You’ve got not many bookings. You know on the Mondays, send out an email and say, hey first come first serve. The first 10 bookings for Tuesday night will get a free bottle of wine with their order, with their food. So people are going to come into your restaurant, what are they going to spend between them? 30 pounds? $50? Whatever. Pizza restaurants like Dominos sends out offers. Why do they do that? Why doesn’t anyone else? Because others aren’t of that size, and they are not listening. You can do the same. Honestly. Anyways, so that’s why you need an email list. People will start to repeat buy and people who haven’t bought before will start to buy. Just keep with me, keep listening, I’ll explain how to do email things. Follow people like Ben Settle. You can listen to my interview with Ben Settle by clicking here. Another great interview about email marketing is the one I did with Ian Brodie. Get Ian Brodie’s book, Email Persuasion. That will explain exactly how to do this. Brilliant book. These guys are brilliant at this. Anyway enough of that. You can ask me as well if you want. Jon@marketingforowners.com. I answer all my emails. Try it. This is Thursday, it’s time for the Drive time podcast. 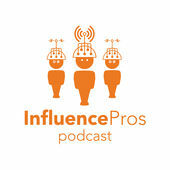 Now today I am giving a shout out for the podcast called Influence Pros. t’s within the ConvinceandConvert.com website for Jay Baer. It’s not one of Jay Baer’s own podcast but its run by Heidi Sullivan of Cision and Julianna Vorhaus of TapInfluence. Now tomorrow, to show you just how Influencing works, we have Carry Jones of Fractal. You might not know of Fractal but they do this for businesses. She is going to give us the PR tips. The way they get PR for their clients. How cool is that? It’s all for free here on the Marketing for Owners podcast. Speak to you later.